Well, not really. I’m here (Beijing) to speak at a conference on Public Service reform. My speech (below) runs a bit counter to the prevailing orthodoxy here, which seems to be even more radical about ‘marketising’ public services than New labour (and the Coalition?). They are also into creating semi-autonomous government agencies and performance evaluation – at least as far as I can figure it out so far. Working through simultaneous translation has many hazards! I’m not sure if he was just being polite, but the lead Minister did say he found it (my contribution) very thought provoking. And it certainly stirred up some discussion. And he, and several other Vice Ministers, actually hung around for most of the day which is more than usually happens at UK conferences, where Ministers (of whatever hue) are usually way to important to actually stay and talk to anyone. One more day of this event to go, so I might say a bit more about it later. But for anyone who’s interested my speech (which draws heavily on my book that’s out next month) is below. There is a tradition in much of Western writing about public administration, and indeed also about more general management, to begin any speech by listing the reasons we are in an era of particularly acute and rapid change. In the past, it is usually implied, there was stability, order and limited change. And in the past, everything about public administration was wrong, or did not work, or was faulty in some way. However, today and in the future all will be change and innovation and everything will be better. There is, to be fair, also a minority of experts who begin their talks with more or less the same scenario, but ascribe different values to it. For them, the past was a Golden Era and the future is full of looming disasters and lost glories. I do not subscribe to either of these approaches, because each tells only one side of the story. I could go on, but these examples are enough to place the reforms of the last couple of decades, and the pace of change, into historical perspective. Is the ‘information age’ really so much more transformative than was Empire and its loss, or two world wars? Despite this history, a great deal has be written over the past three decades about how public administration in most, but not all, Western countries has been through a transformative change from old-style, bureaucratic, Public Administration to the so-called ‘New Public Management’ (NPM), which is supposed to be more flexible, innovative, decentralized and actively managed for performance rather than simply conformance to rules. Like all such sweeping generalizations, this trend turns out to be much more complex and sometimes contradictory in practice than the theoretically “tidy” explanations would tend to suggest. Firstly, of course all former traditional Public Administrations in Western states were not the same – there was a great deal of variety across borders. Some were much more legalistic than others. Some were more centralized and some more decentralized. And so on. Second, just because reforms were labeled as NPM did not mean they were actually the same as NPM in other countries – often diametrically opposite reforms were implemented if different countries and were all lumped together under the NPM label. Indeed, in some cases diametrically opposite reforms were implemented in the same countries and all labeled as NPM. Thirdly, there has often been far more continuity with past practices than is often admitted. Those promoting reform, and often those supposedly analyzing it from ‘outside’ such as academics, usually had an interest in exaggerating the degree of change. In practice, in all cases there were elements of change and continuity. Over the past two decades, for example, I have been following the trend to create more autonomous “agencies” of government in many countries. The so-called ‘Next Steps’ programme of agency creation within the British civil service, which began in 1988, was often taken as an exemplar and as a model to be emulated. In every case I have looked at several things stand out. First, generally the rhetoric of reform far outpaces the actuality of changes. Most public agencies are large organizations with substantial in-built inertia. Change takes time and is often more incremental than radical. There is a frequent tendency for those in power to assume that because a decision has been taken in Washington or Whitehall that it has been implemented on the ground – we all know that is not always the case! Second, the rhetoric of reform is always one-sided and misses out important elements of change. In the case of British civil service agencies – including important welfare agencies like those concerned with employment and social security benefits – they were supposed to be the recipients of various forms of autonomy, decentralization and freedoms. In fact what tended to happen was what I called strategic centralization and operational decentralization. That is parent Ministries and the government gained new, powerful, strategic controls over agencies whilst at the same time allowing greater autonomy in operational issues. The strategic element of these changes was usually downplayed or even ignored in official accounts of the reforms. Third, even though parent Ministries had new, potentially powerful, strategic controls at their disposal they often reverted to the sort of bureaucratic micro-management that existed before the changes were made. So what usually emerges is not a clean break from unified, hierarchical, ministries before the reform to decentralized, semi-autonomous agencies afterwards. Instead the picture is far more complex, with some agencies gaining real autonomy over strategic and operational issues and others not gaining much power over either, and some in-between. It is also worth noting how these things change over time, and especially the cyclical nature of some changes. 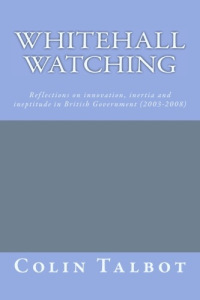 ‘Agencification’ in Britain was part of a trend towards the dissaggregation of public services into smaller units – that trend reversed itself in the early part of the last decade and public agencies have been subject to a wave of mergers and consolidations, sometimes being taken back into Ministries. At one point about 80% of British civil servants were working in Agencies, now that figure is down to about 50% and in a smaller number of larger agencies, and many of the initial freedoms have been eroded in what remain. Many of the Western NPM-style reforms of recent decades have been informed by neo-classical economics, especially public choice, transactions costs and institutional economics. What all these have in common is a specific approach to human nature: humans are always, everywhere, regardless of culture, institutions and personal experience what are called ‘rational utility maximisers’. Economists generally reject the idea that their assumption humans are rational utility maximisers amounts to a theory of human nature, preferring to suggest that these are merely theoretical axioms adopted for convenience. This neatly avoids confronting the ample evidence from social and evolutionary psychology, sociology, anthropology, and even the new field of behavioral economics that humans are not purely, or even mainly, self-interested or rational in their decisions. But to any reasonable analyst this does amount to a theory of human nature, and one that is patently wrong. The other major trend in Western social science thinking in recent decades has been post-modern social constructionism. This assumes that all human institutions are socially constructed and infinitely malleable and the corresponding theory of human nature is that we are all ‘blank slates’, born without any innate preferences for social relationships. The idea I want to advance today is that both of these theories are wrong, or at least at best only partially right. Humans do have innate tendencies – instincts – towards certain forms of social relationship, but these are less rational and more emotional, and take several forms. Human beings are also shaped, to some degree at least, by the environment into which they are born and experience – human conduct is shaped by both nature and nurture. The idea of ‘competing public (or social) values’ that I advance in my latest book is derived from several sources: ‘relational models theory’ from anthropology/sociology; ‘competing values theory’ from organization and management studies; ‘cultural theory’ from anthropology and political science. AUTONOMY – which is based on the principle of ‘market pricing’, maximizing personal advantage from social transactions, freedom to use personal resources in whatever way one wishes and of course individual property rights. I want to explain briefly what I mean by these being four elementary forms of social instinct. The best analogy is what is has been called the ‘language instinct’. All evidence points towards the fact that all normal humans have an instinctual desire to acquire language and an innate ability to do so. Which language they do acquire depends entirely on what they experience – which society and culture they are born into. That this is a “human universal” is simply demonstrated by placing a new born child in a different culture and language context to the one its parents were from – something which has happened millions of times. The child acquires the language of its new ‘home’, regardless of its origins. An American child growing up in China with Mandarin speakers all around it will speak Mandarin. The public or social values instincts that I am talking about here are of a very similar kind to the language instinct. They underlying orientation towards social relations based on solidarity, authority, equality and autonomy are both a universal desire for such relationships but also an innate ability to absorb and practice their specific manifestations. Cultural expressions of solidarity, authority, equality and autonomy may vary widely and a human will tend to adopt those expressions (as with language) that are dominant locally in their specific society. Each of these Public Values can have both ‘positive’ and ‘negative’ sides – thus, for example, Solidarity can result in things like tribalism, religious or ethnic sectarianism, etc but can also result in social solidarity and selfless altruism towards ones fellow group members. Each of these Public Values is to some degree in conflict with the others and can produce tensions. Every human institution actually consists of a blend of all four, but often with one or two in a superordinate position. Thus in classical bureaucracy, for example, the Authority value plays a pre-eminent role, whereas in networks Equality predominates as a value. Because of these conflicts, no human system, institution or organization is stable – there are constant dynamic tensions built into all societies, states, and organizations. Moreover these contradictions are not resolvable through synthesis (in the Marxist-Hegelian sense) but are permanent. As a result, any institution which pushes hard towards only one or two values will experience permanent tensions ‘pulling’ back towards the others. This helps to explain some of the cyclical changes we see in public institutions – between centralization and decentralization; aggregation and disaggregation; etc. These values help us to understand some of the perennial debates about social welfare and the role of the state. For example, when it comes to responsibility for welfare provision should this be the duty of the state (Authority), of the family, civil society or social groups (Solidarity), of the individual or market (Autonomy), and to what degree should any of these be based on principles of Equality and Equity? Again, to use some examples – in the USA the state plays a lesser role in social welfare provision than in most large OECD countries – it only taxes and spends (redistributes) about a third of national wealth (as measured by GDP). On the other hand, the USA has one of the highest rates of charitable giving and individual charitable activity of any OECD country. Most European states spend considerably more on state-public activity (between 40-60% of GDP), but the corresponding rates of voluntary social action are lower than the USA. Welfare systems are also highly variable, with some based on direct state provision, others on mandated employer-based systems, and still others incorporating state, voluntary and personal elements. My point is that all of these can be traced back to differential balances of the values of Authority, Solidarity, Equality and Autonomy in any particular time and place. The perennial debates that take place about how best to create ‘the good life’ for our citizens – how to provide for social welfare – represent these underlying values both in social policy and in the organization of welfare. There is no “right” answer to these problems of policy and organization, but there are “wrong” ones. Different balances between these values are inevitable and legitimate in different societies and at different times. So is some degree of dynamism, as the tensions between contending values play out. But it is also clear that if a society or organization is pushed too far in the direction of one value over others, or of denying one value as against the others, it will be inherently unstable and subject to radical, often violent, correction. My analysis of welfare and public service provision in Britain, for example, would be that in recent years governments have placed far too much emphasis on a single value – Autonomy – at the expense of other important values. The over-emphasis on choice, competition, and more recently so-called ‘personalization’ of services risks undermining the values of Solidarity and Equality in particular. In some respects this over-emphasis on the principle of Autonomy is itself a corrective to its neglect in the post-War rise of the welfare state, which tended to emphasize the professional power (Authority) of doctors, teachers and other professionals as against the Autonomy of the recipients of public welfare, education and health services. But since the 1970s we have over-reacted and now gone too far in the other direction. Too much emphasis on Autonomy risks undermining the Solidarity that allows for redistributive taxation and benefits, the Equality that ensures all feel equally treated by the state, and even the Authority of the state to impose sometimes necessary solutions. Similar phenomena can be observed in the organization of state welfare. An over-emphasis on the value of Autonomy – in the form of decentralization and dissagregation – has often been followed by a period of counter-reform in which Authority is re-established and organizations brought back together. We in Briatin went through the former in the 1980s and 90s, and the latter in the past decade. Today we face a new round of reorganizations which will allegedly grant much greater Autonomy to the producers of state welfare services – teachers, doctors, etc. I predict confidently that if these reforms are enacted as currently proposed within a few years there will have to be a re-assertion of Authority, at least to some degree. I realize that what I have been saying today offers no easy answers. But I believe the approach does offer some tools for thinking about the dynamics of policy and organization in the ‘public domain’. It allows us to think about the dynamics of change and the continuities that always underpin public welfare systems. It may not allow us to predict the future, but it does allow us to understand the past and at least make educated guesses about the consequences of some choices. Rather like meterology, I think we will always better at explaining why it ‘rained’ in policy or organizations yesterday than we will be able to predict whether or not it will rain again tomorrow, in anything other than probabilities. Talbot, C. (2010). Theories of Performance – organizational and service improvement in the public domain. Oxford, Oxford University Press (forthcoming). ← OBR: Dead Duck Waddling? A very interesting and relevant insight. I agree that such radical reform as currently proposed in the UK will indeed lead to a reassertion of state autonomy, in the very near future. A recent ComRes poll established that over 60% of respondents would prefer local councillors to decide which services should be cut, less than 20% favored MPs to make these decisions.